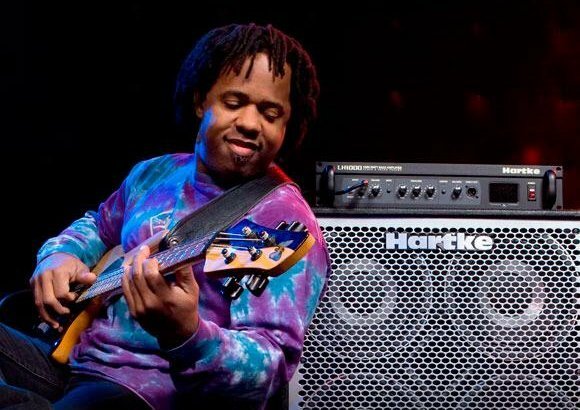 Victor Wooten redefines the word musician. Regaled as the most influential bassist since Jaco Pastorius, Victor is known for his solo recordings and tours, and as a member of the Grammy-winning supergroup Béla Fleck & the Flecktones. He's a true innovator on the bass guitar, as well as a talented composer, arranger, producer, vocalist and multi-instrumentalist. After gaining extensive notoriety with the Flecktones, Victor set his sights on a solo career, first forming Bass Extremes with fellow low-end lord Steve Bailey and releasing the ground-breaking 1996 solo album Show of Hands. Victor has won two Nashville Music Awards for "Bassist of the Year" and is the only 3-time winner of Bass Player Magazine's "Bass Player of the Year". Today, Victor continues to record and tour with the Flecktones, various other artists and as a solo artist. He also leads six to eight camps at his Wooten Woods Bass/Nature Camp each year. Please Call (303) 827-3163 to Reserve Seats. Must be present and seated by 12:45pm or your seat will be given to the next person in line.